The question to ask is – what do Akhilesh Yadav and the SP gain from an alliance with BSP chief Mayawati? If there is already a loser before the first vote is cast in the 2019 Lok Sabha elections, it’s Samajwadi Party chief Akhilesh Yadav. And, this is regardless of the poll outcome on 23 May. For those who are wondering Mulayam Singh ko gussa kyun aata hai or why the Samajwadi Party (SP) patriarch gets angry so often, the answer is simple. He can see his son, Akhilesh Yadav, squandering his political legacy. Yet, Jr. Yadav is confident – and politically impudent too. He has scheduled this week a joint rally with Bahujan Samaj Party (BSP) chief Mayawati in Mainpuri, the parliamentary constituency of his father, barely three weeks after Mulayam had publicly upbraided him for giving away half of the seats to the BSP in alliance and weakening the SP. While one waits to hear Sr. Yadav on this, it’s difficult not to agree with him. Let’s start on a relatively positive note. For a moment, think that the SP-BSP alliance trounces the Bharatiya Janata Party (BJP) in Uttar Pradesh in May, leading to the ouster of Narendra Modi from power. Let’s also assume that the mandate the SP-BSP get in Uttar Pradesh — as well as in Madhya Pradesh and Uttarakhand where they have decided to field candidates — propels Mayawati towards the prime ministerial chair. What would Akhilesh gain? He must believe that his ‘bua’ would then come to thank him and offer the chief ministerial chair to the ‘bhatija’ in 2022. That is, if the SP chief has taken to The Everly Brothers (All-I-Have-to-Do-is-Dream fame), of late. Mayawati lives in a real world. She has managed to play a senior partner in the alliance with Akhilesh, with the BSP set to contest 38 seats as against the SP’s quota of 37. That’s despite the fact that the BSP has been on a continuous slide since the 2007 assembly election when it secured a majority — 30.43 per cent votes in 2007, 25.95 per cent in 2012 and 22.23 per cent in 2017. The SP’s vote share has been largely stable during this period – 26.07 per cent in 2007, 29.29 per cent in 2012 and 28.32 per cent in 2017. In 2014 Lok Sabha elections in UP, the SP had done better, securing 22.35 per cent (with five seats) vote share as against the BSP’s 19.77 per cent (with no seat). Apart from the shrinking vote share, Mayawati was also confronted with growing disillusionment among her core support base. Her vows for Dalit welfare and empowerment no longer captivate the Bahujan Samaj the way they did in 2007 when the Dalits gave her a clear mandate in UP only to be left disappointed. A section of them, non-Jatavs, were inclined to switch loyalty to even the BJP in 2014 Lok Sabha elections and the remaining are now looking at the rise of Bhim Army chief Chandrasekhar Azad with curiosity and hope. Now, the question to ask is – would the BSP chief be generous enough to return the favour to Akhilesh if he were to help her fulfil her prime ministerial dreams? First, there is little likelihood of her dream being fulfilled even in the unlikeliest event of the opposition trouncing the NDA and Rahul Gandhi and others giving up their claims. But, hypothetically, if it happens, a shrewd politician such as Mayawati would be foolhardy to waste this opportunity to expand and strengthen her party for the sake of showing gratefulness to a rival politician. Second, again hypothetically, if an opposition combine comes to power at the Centre and both the SP and the BSP wrangle over key portfolios, political reasoning would dictate that Mayawati treats Akhilesh as her main adversary in UP, and not the BJP without Narendra Modi. As for Akhilesh’s gains from the opposition’s victory, he and some of his party colleagues would get a few ministries at the Centre. But, in the process, he would have ceded his party’s current advantage over the BSP and also helped Mayawati consolidate her hold among Dalits and enhance her standing among Muslims who have been largely indifferent to the BSP despite its claims of having given them a riot-free government from 2007 to 2012 unlike the subsequent SP government. These are the scenarios if one starts on a positive note about the SP-BSP alliance. Now, consider the possibility of the SP-BSP alliance making little difference to the BJP’s fortunes in UP as the initial reports from the ground suggest. It would mean that the much-vaunted Dalit-Yadav-Muslim combine came unstuck. Trust Mayawati to accuse Akhilesh of failing to transfer his party’s votes to the BSP. And when – not if – this alliance fails, Akhilesh would find the ground slipping beneath his feet. He is not known to enjoy the emotional bond with the Yadavs that his father does. They seem to consider the BJP as their second home, if need be. And Muslims always had the Congress as their second choice. The SP chief like other opposition leaders is seeking to make the most of anti-Modiism. Having snatched control of the party from his father, he now needs to prove his mettle as a politician. His strident anti-Modiism is an attempt to inherit his father’s Muslim vote bank. He can hope for Yadavs’ support in this election but must win to consolidate it. However, scratch the surface and you will find that both Akhilesh and Mayawati are more worried about the Congress than the BJP. The SP finds the Congress competing for its Muslim vote bank while Mayawati is insecure about her Dalit vote bank. At the core of their anti-Modiism, therefore, is anti-Congressism. Once the Congress is annihilated in UP, the SP and the BSP would be better placed to regain their pole position in the state even in a triangular fight, with the BJP remaining the third player. 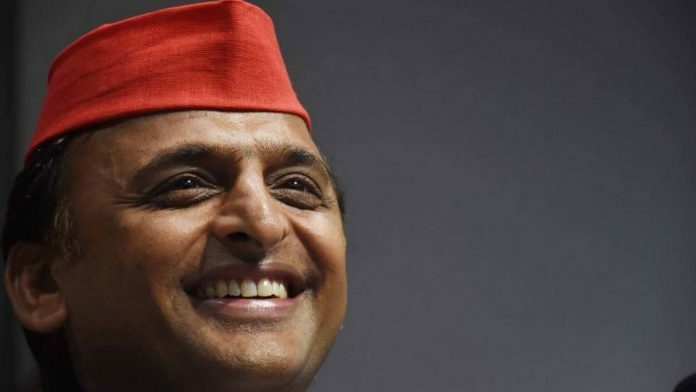 In an interview to ThePrint last week, Akhilesh suggested that the SP-BSP should be left to defeat the BJP in UP and the Congress should concentrate on other states. Surely, Akhilesh has his own reasons for placing so much trust in Mayawati. But Mulayam Singh Yadav could be wiser from past experiences when he saw the BSP supremo using and throwing away her alliance partners – the SP and the BJP at different points in time – in her pursuit of power. Interesting take. Don’t agree with many things but a first if a kind article which analyze the various permutations. Excellent analysis by DK Singh, but would like to add another point. SP is contesting against BJP in its strongholds while BSP is contesting in relatively swing constituencies. Therefore, SP is facing a much tougher challenge than BSP. Akhilesh should have been more demanding in the seat sharing talks rather than supplicating before Mayawati. Akilesh Yadav has constantly proven to be failure. He alliance with Congress was disaster for SP, he gave them too many seats which Congress lost. it is same short sighted policies he is following. The problem is inherent difference of interests between Yadavs & Dalits. So there won’t be too much vote transfer with BJP ending up as second choice of both of these groups. Same thing happened with His Congress alliance. Congress vote did not transfer to SP candidates. Now it is question mark whether SP Muslims vote will transfer to BSP candidates or end up with Congress. Biased analysis by D. K . Singh. Mayawati is the past, Akhilesh is the future. Had they not come together, an outcome similar to the Assembly poll in 2017 would have come about. There is, of course, zero prospect of Ms Mayawati becoming PM. By giving her 38, keeping 37 for himself, Shri Akhilesh is showing maturity, not letting ego get in the way of enlightened self interest. Had it not been for Ms Mayawati’s intransigence and the Congress’ cupidity / childishness, AY would have got the Congress into the tent, with about ten seats, sealing the outcome. Netaji is completely over the hill, senile. The writer appears to be a supporter of B.J.P. He is envious of the great coordination qualities of Akhilesh. The truth is that due to his flexibility, Akhilesh is the most capable person for the post of P.M. They split the Muslim vote with Congress. They split the anti BJP votes between Congress and themselves. Priyanka Vadra may have been inducted to also attract BJP’s Brahmin votes but, this will not happen. The “Family” is NOT seen as ‘Brahmins’, whatever else they are may be, notwithstanding the Congress party’s desperate attempts to flourish Rahul’s Janeu dhari Brahmin credentials ( which may have actually lost them a vote bank).. She is making no impact at all on the ground, with the Bhim Sena leader rejecting any support to Congress. despite Priyanka’s visit. Whichever way this is seen, BJP should benefit. D K Singh. Such a cynic.. What does Akhilesh gain? What stupid question? Suppose BSP and SP would have gone their separate ways?There lies the answer. Between Akhilesh and Mayavathi the latter nay be the gainer. But their main aim is to defeat BJP. In they both gain.AKHILESH IS A GAINER whatever charlatans like Singh may postulate. I think it is a smart move. BSP may be contesting on larger number of seats than SP – but it will get lower number of seats in the final tally. By doing so, SP has reasonably assured that BJP is on a significantly weaker wicket. Mayawati may have any aspirations – there are others also with similar aspirations. Akhilesh is smart enough to ensure that he has a handle for seeking leadership at the state elections. It is a different matter that Mayawati would dump him at the local level. Between BSP and SP, the sympathetic vote would be with Akhilesh. It may be a small amount – but at the swing level it will have a large impact.